14.1 Groundwater and Aquifers Porosity is the percentage of open space within a rock or unconsolidated sedimentary deposit, while permeability is the facility with which water can be transmitted through that material. An aquifer is a body of rock or sediment that has sufficient permeability for water to be extracted, while an aquitard is an impermeable body. An aquifer is described as confined if it is overlain by an impermeable layer (confining layer), or unconfined if it has no such confining layer. 14.2 Groundwater Flow The water table is the upper surface of the saturated zone in an unconfined aquifer. A confined aquifer has a potentiometric surface (instead of a water table), which is defined as the level to which water would rise if a well were drilled into the confined aquifer. Change in groundwater head over distance is the hydraulic gradient. The theoretical velocity of flow in an aquifer is defined by Darcy’s law as the hydraulic conductivity (a measure of permeability) times the hydraulic gradient (V = K * i). It is possible to predict groundwater flow paths if we can draw equipotential lines within an aquifer. 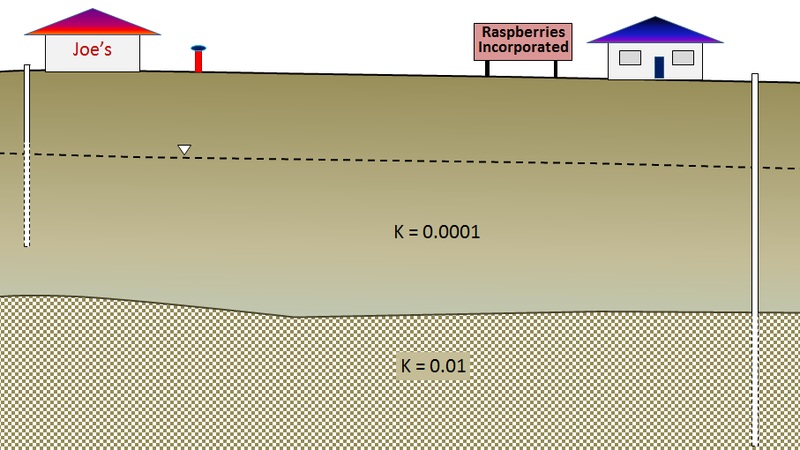 In areas where limestone has solutional openings (e.g., caves), water flow is determined by gravity above the water table and by the hydraulic gradient below the water table. 14.3 Groundwater Extraction Groundwater can be extracted at springs, but in most cases, wells are needed to ensure a steady supply. Pumping groundwater from a well lowers groundwater head near the well, creating flow toward the well. This creates a cone of depression around the well. Excessive pumping can lead to a well running dry or to a lack of water in nearby wells. During extended periods of dry weather, or if consistent over-pumping occurs, aquifers may be depleted. Observation wells are used to monitor short-term and long-term changes in water levels that can indicate changes in aquifer health. 14.4 Groundwater Quality The quality of groundwater can be compromised by both natural and anthropogenic contamination. Natural contamination can be caused by particularly high levels of contaminants within the aquifer itself, but is more commonly a result of enhanced solubility of contaminants due to the aquifer chemistry. Some common sources of anthropogenic contamination include agriculture, industry, mining, landfills, and leaking underground storage tanks. We can assess the vulnerability of aquifers to contamination by mapping regional variations in parameters such as depth to the water table, permeability, slope, and precipitation. 1. What is the difference between porosity and permeability?2. Both sand and clay deposits can have high porosity, but while most sand also has high permeability, clay does not. Why not? 3. Arrange the following types of rock in order of their likely permeability, as measured by the hydraulic conductivity (K): mudstone, fractured granite, limestone in a karst region, sandstone, and unfractured gneiss. 4. Sue, the owner of Joe’s 24-Hour Gas, has a shallow well (15 m deep) as illustrated in the diagram. The well can only produce 0.5 L per minute, but that’s enough for water to make coffee and supply a washroom that gets used several times a day. Frank, who operates a raspberry farm next door, uses up to 250,000 L of water per day to irrigate his crop during summer. He gets water from a deeper well that can produce 250 L/minute. See the diagram below. (a) What type of aquifer does Sue use? (b) What type of aquifer does Frank use? (c) It seems that what Sue calls an aquifer is an aquitard (confining layer) from Frank’s perspective. How is that possible? 5. Two wells 70 m apart have water levels of 77 m and 83 m above sea level respectively. The aquifer has a hydraulic conductivity of 0.0003 m/s. What is the likely velocity of groundwater flow in the region between these two wells? 6. The well in question 5 with a water level of 83 m is heavily used and after several months the water level has dropped by 9 m. How will that affect the flow of groundwater in the area between the two wells? 7. Explain why it is important for provincial governments to operate observation well networks. 8. What is the main difference between natural and anthropogenic contamination of groundwater? 9. Why is a highly permeable aquifer more vulnerable to anthropogenic contamination than a less permeable aquifer? 10. How can a livestock operation lead to contamination of groundwater? What is the most likely contaminant? 11. Which mineral in the rock of a mining operation is typically responsible for acid rock drainage? 12. Why is it necessary to test the permeability of the soil before constructing a septic field? Chapter 14 Summary by Steven Earle is licensed under a Creative Commons Attribution 4.0 International License, except where otherwise noted.